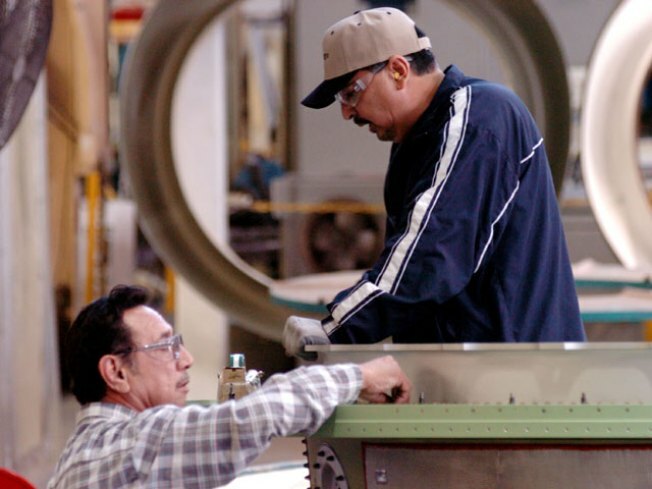 Workers Art Vejar (L) and Henry Padilla assemble a 737 jet engine component at the Goodrich Corporation plant February 28, 2005 in Chula Vista, California. The European-based aircraft manufacturer, Airbus, has chosen aerospace and defense parts supplier Goodrich Corp. to provide the engine coverings and thrust reversers for its proposed A350 aircraft, designed as a rival to Boeing Co's 787. Susan Marvin went into 2010 expecting it to be much like 2009: weak and difficult. So when the president of the Minnesota manufacturing company Marvin Windows and Doors started to see orders pick up a bit in March, she was pleased but not overly confident. “I would have to say there was a very tentative optimism,” she said. So far, the growth in orders has continued. That’s allowed Marvin, whose company makes windows and patio doors for upscale customers, to increase hours for her manufacturing employees and reverse some of the pay cuts she instituted for her salaried employees. Still, she remains hesitant. Amid the nation’s slow and stubborn economic recovery, an unlikely sector is showing surprising strength: manufacturing. The indisputably old economy stalwart has been growing and adding jobs in recent months, with companies ranging from equipment manufacturing Caterpillar to automaker Ford reporting an uptick in orders and business. “Manufacturing is the sector that’s been growing most strongly,” said Paul Ashworth, senior U.S. economist with Capital Economics. But experts say that’s not all good news: One big reason for the sector’s relative success is that it was one of the earliest and hardest-hit sectors during the recession. “Manufacturing’s doing OK simply because manufacturing totally and completely collapsed a year ago,” said economist Joel Naroff of Naroff Economic Advisors. The Institute for Supply Management, a private research group, has logged 10 months of expansion in the manufacturing sector, although the pace of growth slowed slightly in May. The forecast for June is due out Thursday. Even with robust growth, the manufacturing sector has yet to claw back from the losses it suffered during the recession, when industrial production fell sharply, the auto industry experienced extreme upheaval and employers cut millions of jobs. “We’ve come back, clearly, faster than the rest of the economy, although we still haven’t dug our way out of the recession hole,” said Nigel Gault, group managing director for North America with IHS Global Insight. Many experts also expect that manufacturing growth will slow in coming months, as companies fill their depleted storerooms and otherwise make up for the big drop in production during the recession. “I don’t think there’s any chance that it would continue,” Ashworth said. As the sector has started to recover, about 126,000 manufacturing jobs have been added over the past five months, bringing the total number of people employed in manufacturing to nearly 11.7 million, according to the Bureau of Labor Statistics. That’s still about two million fewer jobs than before the recession began in December of 2007, and some economists have questioned whether the nation will ever get back to the manufacturing employment levels we saw back then. Even before the recession, U.S. manufacturing was facing intense competition from overseas producers and increasing pressure to make more products with less workers. Gault, of IHS, expects manufacturing job growth to peak at around 13 million jobs sometime in the next several years and then resume a long-term declining trend. At Marvin Windows and Doors, Marvin — the company’s president and its founder’s granddaughter — decided from the beginning that she would not lay off any of the company’s approximately 5,000 employees during the course of the recession. Instead, she cut hourly workers from 40 hours to 32 hours a week and reduced management salaries by 5 percent. “Clearly we had more employees than we had work,” Marvin said. But to Marvin, the cost to morale and productivity that would come from laying off workers was not worth the financial gain. Instead, she had employees spend time doing additional training and looking for ways to run the plant cheaper and more efficiently. With orders up, Marvin said some of the company’s plants are back to 40-hour weeks, while others have gone up to 35 hours. Salaried employees also will soon see a 2 percent increase in their reduced pay, she said. By avoiding layoffs, Marvin thinks her company was in a better competitive position to ramp up production when business began to improve. She said her concern is that the other companies she relies on for things like home construction projects won’t be able to ramp up as quickly. “If they’re not able to respond to a turnaround and/or if the dealers don’t have the financial wherewithal to bring in inventory, then the house package becomes a problem and ultimately it becomes an issue for us,” she said. If the robust pace of manufacturing growth ebbs as expected, economists say the big question is what, if any, sector will come in to fuel more growth. With unemployment still hovering near 10 percent and factors such as the stock market weighing heavily on people’s minds, consumer spending is not showing as much strength as some might hope. In addition, the housing market remains mired in uncertainty. “It’s a big concern, that question of what sectors are going to step up and lead, because at the moment the traditional cyclical leaders are absent,” Gault said.